For those who don’t know, Sinemia is a movie pass app that grants their subscribers a set number of movies per month based on their plan. Customers can choose between a Classic (2-D Movies) or an Elite (3-D & 4-D Movies) plan. 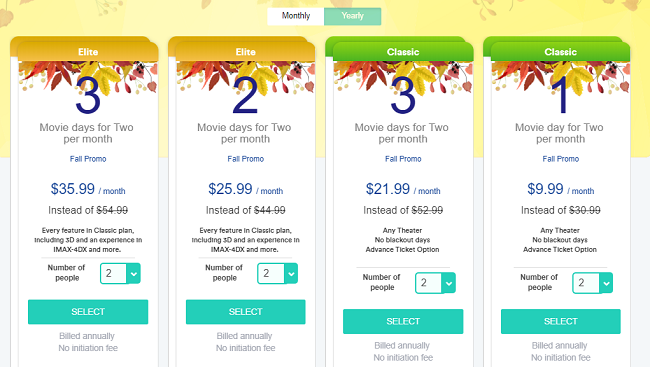 Each plan is charged a set rate, either monthly or annually that grants customers between 1-3 movies per month, or the ultimate plan, 1 movie per day. Some may be wondering why they should choose Sinemia over Movie Pass? There are some features that Sinemia has that Movie Pass doesn’t. These features are some of the deciding factors that win over new customers. What are these features though? Possibly the most convenient feature that Sinemia has is their family plan (or friends plan since you don’t have to use it with family). It works like a family plan on Spotify, one member can purchase the plan and up to 4 members of the family can use the pass that was purchased. Additionally, Sinemia offers the ability to purchase your tickets in advance (A feature that Movie Pass fails to have) so that you’d never have to worry whether or not you’d get to sit with your friends or family. Single account holders have the ability to purchase their tickets a head of time worry free of black out days as well. Not only that, the tickets aren’t tied to a specific person, so a ticket can be gifted or passed to another family member or friend. Sinemia offers a variety of plans that customers can choose between. If they’re frequent movie goers, they can purchase a plan that satisfies their movie going needs. However if you’re like me and may watch 1 movie per month, they still have a plan perfect for you. To put the pricing into perspective, a movie goer may have to pay up to $12 just to see a single 2-D movie per month. The 1 Movie per month plan from Sinemia costs just $4.99 per month to see a single movie. The math doesn’t lie, it’s drastically cheaper than purchasing a ticket at the theaters. Purchasing their monthly plan allows those who use movie pass to give this service a try without having to commit to an annual pass. There is a catch though. Unfortunately there is a one-time initiation fee of $19.99 for those who decide to go with the monthly plan – and this is per person. If a new customer wanted to try out Elite 2 Movies Per Month family plan of 2 people, there would be an initiation fee of $39.98 plus the monthly cost. We recommend sticking with an annual plan to avoid all those additional costs. The interface of Sinemia may be quite confusing at first, but we’ll walk you through the steps to get your advanced tickets with no convenience fees. Just follow our steps and you’ll be able to enjoy your movie ticket for free. Open the Sinemia app and select “Planning,” NOT the Watch tab. Create an account with Sinemia. Use our referral link to get yourself $10 credit that can be used on future ticket purchases. Click “Advance Ticket.” Scroll through the tutorial. As of publishing time, you cannot skip the tutorial regardless of how many times you’ve seen it. Go back to the Sinemia app and click “Get Advance Ticket.” Enter the theater, date, and showtime of the movie you’ve selected. Now the big question, should you subscribe to Sinemia? Through my personal experience as an infrequent movie goer, their Classic 1 movie per month pass was perfect for me. It helped me save money since 2-D movies in my area tend to cost around $10-$12 per ticket, and that’s not even including the prices of the popcorn and drinks that I buy as well! So yes, I believe that customers should definitely consider getting Sinemia. They offer great annual rates that can greatly bring the price of your movie tickets down. One thing I do recommend is avoiding the monthly plans so that you don’t have to pay those initiation fees. If Sinemia has sparked your interest, sign up using our referral link and you can score $10 in Sinemia Credits that can be used when purchasing future movie tickets.